Two X chromosomes. Generally, one will be silenced, but sometimes stem cells re-activate their second X. But researchers studying human embryonic stem cells growing in the lab have found that sometimes stem cells re-activate their second X. The reactivated X expresses extra genes, and this may foul up experiments and scuttle potential therapies. Now researchers from the Paris Diderot University and the University of Connecticut have discovered a marker, and potentially a mechanism, for how the extra X reactivates – and they hope to develop a way to prevent it. Chromosomes house a cell's DNA. They're made of chromatin, long necklaces of protein beads called histones with strands of DNA coiled around them. If a particular strand of DNA coils loosely, the cell's machinery can get at it and express the genes that DNA encodes. But if the DNA coils tightly, its genes stay silent. On the X chromosome, regions of silenced DNA are coated by a long, non-coding RNA called XIST. RNA is an important part of the gene-expression machine in the cell, but XIST RNA doesn't seem to code information for genes and proteins. Instead it silences them, by latching on to DNA in the extra X chromosome and coating it. In normal development – at least in mice – once the extra X chromosome is silenced by XIST, it stays silenced. Mouse embryonic stem cells never reactivate their second X. Researchers were mystified as to why human embryonic stem cells sometimes do. 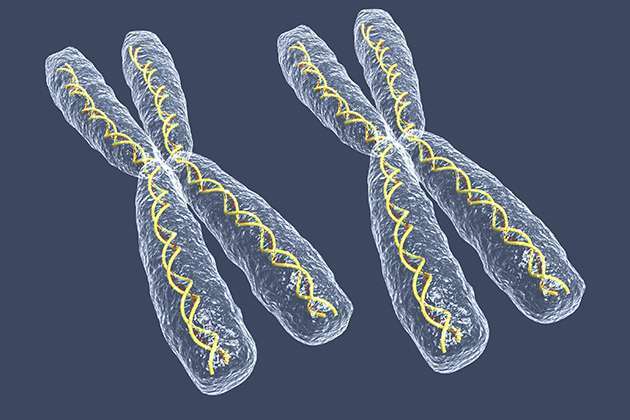 The team of researchers led by Claire Rougeulle at Paris Diderot University used a new technique to examine X chromosome activity in single cells. They found that when the X chromosome is reactivated, a new long, non-coding RNA appears on it. They called this new RNA XACT. It's not clear what role XACT plays in reactivating the extra X chromosome, but XACT appears all over regions of the reactivated X chromosome that start expressing genes. And wherever XACT appears, XIST erodes. Rougeulle and her team worked closely with UConn's stem cell core to capture human embryonic stem cells at a sufficiently early stage of development to do these studies. UConn scientists were also involved in the analysis of the data from genomics experiments needed to discover and characterize XACT. The researchers aren't sure whether the XACT/XIST dynamic they are seeing in human embryonic stem cells is the true dynamic that occurs in human cells, or whether those human embryonic stem cells that reactivate their extra X have a problem. "This study tells us that we need to purify human embryonic stem cells in an even earlier stage of development, before XACT competes with XIST, and even before XIST begins to silence one of the X chromosomes," says Marc Lalande, professor and chairman of the Department of Genetics and Genome Sciences at UConn Health, and a co-author of the study. "Catching such a 'ground' or 'naïve' state of human embryonic stem cells is what we will continue to work on with Dr. Rougeulle." Researchers have already observed that in very young human embryos, XIST accumulates around every X chromosome, whether the embryo is male or female. Rougeulle, Lalande, and the rest of their team would like to test whether XACT is expressed at this early stage, too. They suspect it may play a role in preventing XIST from permanently silencing X chromosomes in early human development.